Our AquaSprouts premade aquaponic kit came in the mail before we made it to the big city to buy an aquarium. So we put together as much as we could and are now in a holding pattern until the weekend. While waiting, I figured I'd dig some greenery out of the garden to fill the grow bed. Herbs are a good fit for aquarium-size aquaponics setups because they handle low light and nutrients while producing a crop that seems much larger than it is --- a spring of fresh green onions goes a long way in sprucing up an ordinary winter meal. To that end, I'll be transplanting celery, chives, thyme, and Egyptian onions and will soon start some basil from seed to round out the potential crop. 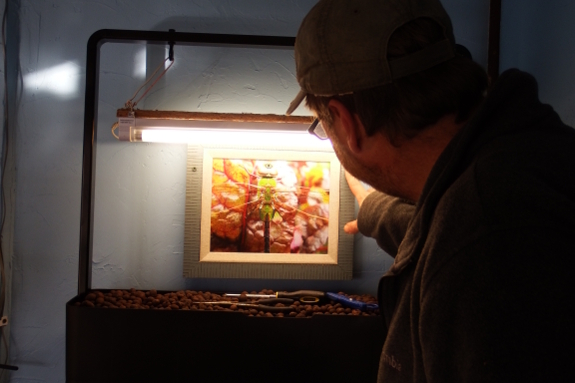 Here's one last shot...just because I like seeing Mark backlit as he puts the finishing touches on the grow bed. Next up --- getting the water flowing! I'm looking forward to seeing your aquaponics setup and compare it to my own. Back in the 1970s, I ran two huge commercial aquaponic tomato greenhouses for about three months (until the FBI showed up looking for an airplane that had landed nearby with drugs from S. America with guns drawn and looking for all the world like something out of the X-files.) Learned a lot about aquaponics then. When I moved to TN, after reading about an in-house aquaponics I set up a system with a long underbed plastic container filled with sand that had a hole in the bottom of it near one end of the container. I slightly lifted the other end to provide an angle and underneath the hole I placed a bucket. The idea was that once a day you poured a solution of water and fertilizer into the container so that over the course of the day it would filter down through the sand medium and then drip into the bucket below. Well it worked like a charm! Got lots of lettuce and spinach and radishes. Since then I've repurposed that container to hold regular medium and I'm now also getting lettuce, spinach and radishes here in December. I’ve been experimenting with Aquaponics for a few years now. I have been using gravel grow beds, fill and drain system with home made bell siphons to raise vegetables and tilapia in the fish tank (300 gal stock tank). The problem I have run into is the grow bed silting in over time and requiring the gravel to be removed and cleaned. That may not be as much a problem with a small indoor system. I have been reading this site (https://www.friendlyaquaponics.com) and subscribed to their emails for a couple of years now. I think their floating raft system may be better, at least in my case. I’m in the process of building a small raft system in the basement where I have a couple of aquariums with my breeder fish and fingerlings waiting to go outside. The long range plan is to redesign the outside system and put it in a small greenhouse/hoop house. Good luck with your system. It’s a very interesting process and many different designs to play with. 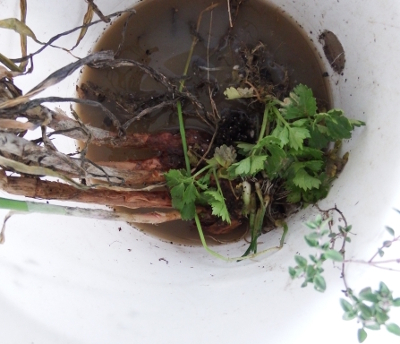 You can toss some red worms into your grow bed and they will help process the fish waste. I enjoy the experimental nature of your homesteading adventures. 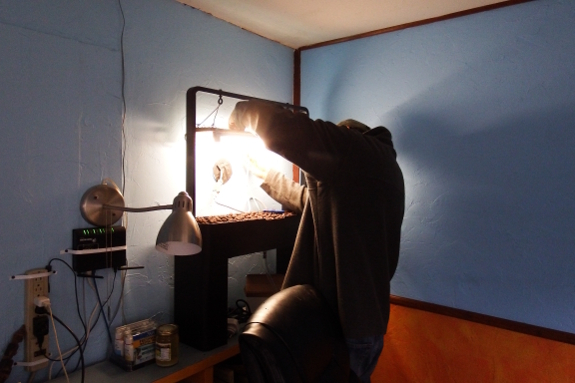 Are you at all concerned about the need for using electricity for aquaponics?